I really,really want to read this book! 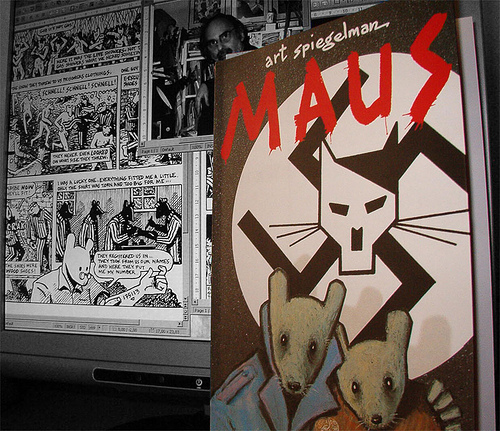 Maus,The Arrival,V for Vendetta and Persepolis are all on my wish list! I’m glad that your review is consonant with everything I’ve heard about this book so far; it’s yet another reason why I should buy it! Thank you, Persepolis is on my list to get soon. The Arrival is amazing, I blogged about it recently. Probably my favourite book of all time if I had to choose. I will read it someday, that’s for sure. 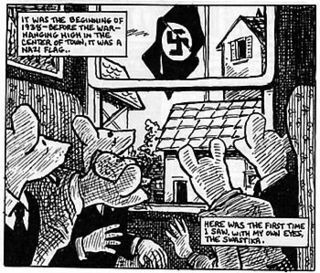 But I’ve had enough Holocaust literature for a while, especially children’s literature. What is “The Arrival” about? It’s brilliant about emigration (possibly), so many meanings to it!Here’s a blog I did about it awhile ago,might be of some interest to you.